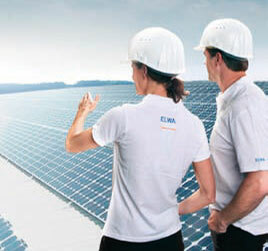 ELWA P2H-systems fulfil the the requirements to be used for minute reserve or secondary reserve. Existing combined heat and power stations and ELWA P2H systems ca be operated „in tandem“ to offer perfect balancing energy and process heat. ELWA P2H system can be operated aside of the energy balance market to make use of energy peaks – e.g if the grid provider would shut down the customers wind turbine (feed-in management), the turbine can be kept in operation to generate heat. 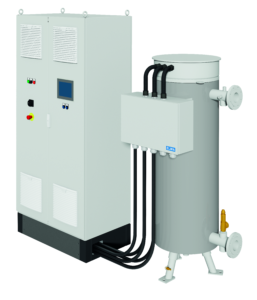 ELWA P2H system provide flexible negative balancing energy, preferably connected to district heating systems because of the permanent high demand for thermal energy. Absorption-type refrigeration systems / large thermal buffer systems / geothermal buffer systems / ice buffer systems: Charging with excess photovoltaic energy. The ELWA P2H system has been developed to combine operational safety, high availability and ease of maintenance. The system consists of at least one and up to an unlimited number of units from < 100 kW up to 1.68 MW heating power. The system is modular, scalable and redundant. It offers unique advantages compared to large monolithic systems. Possible blackouts of subsystems can be immediately compensated by hot spares. Subsystems can be taken out of service for maintenance without losing the complete heating power. All parts can be exchanges with standard tools. The necessary space for installation is not larger or even less than for monolithic systems. The systems are installed for parallel operation with bypass piping. Required installation work on customers side: Piping to/from the unit and main supply cable. The ELWA P2H control cabinet with its user-friendly 8.4” control display can control an unlimited number of subsystems. ELWA has always ben active in fields were high availability is paramount.